It seems as though I am building a growing reputation for training actors how to shoot and doing occasional work for TV shows / etc. Trained two television actors how to shoot longbows for a period piece television series about the French monarchy. Trained a theatre actress to shoot a recurve bow because part of a script required her to shoot an Olympic recurve bow out a window off of the stage. Did all of the archery shots for a sports documentary made by TSN. Trained a Quebec musician how to do archery for an episode of a French language television show. Doing various TV clips for CBC, CTV and CityTV. All this work training theatre/TV actors and appearing on television has got me thinking however. Maybe I should offer lessons designed specifically for actors, which is what I have done in the past when teaching actors - tailored the classes to suit their needs. Longbow lessons for the actors who are doing period work, Recurve / Olympic Recurve lessons for the threatre actress who is shooting an Olympic recurve on stage. Toronto does have a vibrant film, television and theatre industry after all. There is certainly a demand for more actors who can do archery properly, as opposed to the current standard which is actors who barely know how to shoot appearing in films/etc and looking like they don't even know how to shoot. So if you are an actor in Toronto and looking for archery lessons in Toronto then I am certainly available to teach you how to shoot properly. Note - I think movie directors should also get archery lessons. Joss Whedon (director of The Avengers) could certainly use a lesson because he apparently wanted the actor (Jeremy Renner) to look "heroic" while shooting, no matter how mistakes the actor was making. 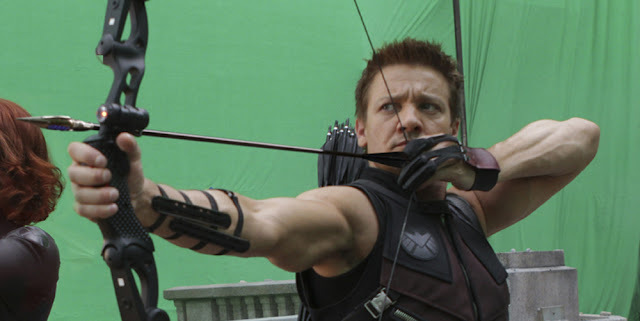 Hawkeye's archery style was rather ridiculous. His drawing elbow is too high, his bow arm elbow is locked when it should be relaxed, he is squeezing the bow when his fingers should be relaxed, he is wearing TWO armguards on his bow arm because apparently the actor kept hitting his arm (due to his locked elbow) [if you look closely you can even see bruises on his bow arm], he is pulling to his chin when he should be pulling to his mouth, he has both eyes open when he should be closing his right eye since he is left eye dominant, his finger positions on the string are uneven and curved inwards when they should be even and aligned, and it looks like he is leaning backwards a bit - a sign of bad posture. There is a lovely article on GeekDad titled "Hawkeye, World's Worst Archer" which doesn't go in to all the details I just did, but the idea that people are calling him "Hawkeye, World's Worst Archer" is rather amusing. There is a long history of professional archers teaching actors how to shoot. Below are a few examples. 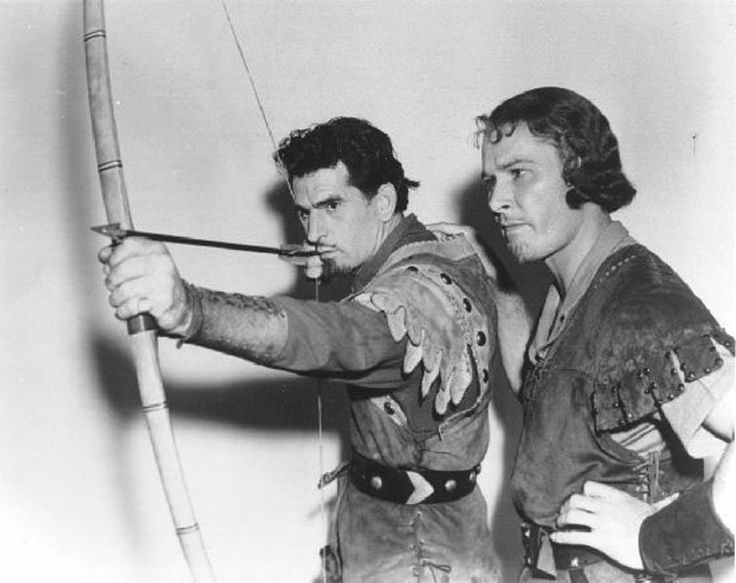 Howard Hill teaching Errol Flynn for "The Adventures of Robin Hood". 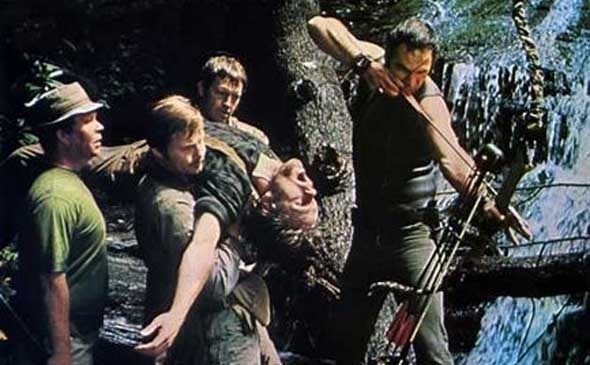 Burt Reynolds and Jon Voight received archery training prior to their roles in "Deliverance". Fred Bear remarked that Burt Reynolds caught on quickly and was a natural. Sometimes the professional archers would also appear in cameo roles in the films or be tasked to perform any of the trick shots during the filming, like Howard Hill who did all of the tricks shots for "The Adventures of Robin Hood" and appeared in the competition scene of the film. What bothers me (and many archers/film critics) is when a new film comes out and the actor/actress clearly doesn't know how to shoot or someone taught them the wrong way to shoot that style of bow. A famous example of this is Jennifer Lawrence of The Hunger Games franchise. I have already explained in a previous post why Jennifer Lawrence's shooting style is wrong and thus I am instead going to point you to that older post and the video below, in case you are curious about learning why that particular style is wrong. See The #1 Mistake made by Amateur Archers: Not Anchoring Properly to learn more about why Jennifer Lawrence was trained wrong.